Welcome to the Clark Sisters (aka the Sentimentalists) web site! Welcome to the Clark Sisters (aka the Sentimentalists) web site. We will be sharing the story of the Clark Sisters — Jean, Ann, Peggy and Mary. 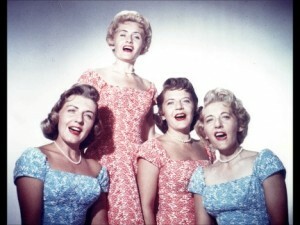 Four of six sisters from North Dakota who moved to New York and sang with Tommy Dorsey then later moved to California to record and perform studio work. Also known as the Sentimentalists when they were with the Tommy Dorsey Band, they recorded hits such as Chicago, On the Sunny Side of the Street and I Should Care . Albums included Sing, Sing, Sing , The Clark Sisters Swing Again, and Beauty Shop Beat.